The DEWALT 20V Max Li-Ion Cordless Drill & Impact Driver Combo Kit features a compact, lightweight design perfect for tight spaces. The DEWALT 1/2" (1.27 cm) Cordless Drill/Driver features a 1/2" keyless single-sleeve ratcheting chuck and 16 clutch settings. 1/2" Drill outputs 300 UWO of maximum power and has a variable speed range of 0-450/1,500 RPM. The DEWALT 1/4" (0.6 cm) Cordless Impact Driver features a 1/4" hex drive quick-release chuck. 1/4" driver has 1,400 in-lbs of maximum torque, a variable-speed range of 0-2,800 RPM/0-3,200 IPM and three LED lights with 20 second post-trigger release time delay. Ergonomic rubber overmolds for added comfort and control. 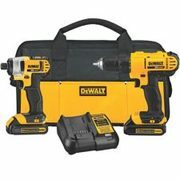 Includes: cordless drill, cordless impact driver, (2) 1.3Ah batteries, charger and soft case. Replacement charger (0543116); replacement batteries: 2Ah with Bluetooth (0544269), 2Ah 2-Pack (0543201), 4Ah 2-Pack (0543308), 5Ah (0740519) and 5Ah 2-Pack (0740532). Holds up to 42" TV. Black lacquered frame. Corner placement option. Wire management. Holds up to 52" TV. Black lacquered frame. Corner placement option. Wire management.